Learning is a multi-sensory experience. Educators understand that classroom set-ups need to optimize sight lines for students, and provide consistently high levels of access to teachers’ spoken presentations and the audio components of multimedia learning. There’s even more to the story, when teachers, technology specialists, and administrators factor in the multiple learning styles that students bring to class. Some are visual. Some are kinesthetic. Others learn best by hearing information and speaking to reinforce their knowledge. And of course, today’s wealth of technology-enhanced learning resources and the drive for personalized learning also underscore the need for high quality audio delivery as a required part of instruction. Some learners are distracted by noise around them and that makes it difficult to focus and stay on task. For these learners, many educators are recognizing the advantage of noise cancelling headphones, to limit noisy distractions and interruptions. Other learners improve comprehension and retention by listening to instructional content and/or reading and listening simultaneously. Here, clear, crisp audio is critical so students can engage fully in the concepts and content being presented. And in reading and foreign language classes, students need to speak aloud and hear themselves accurately, to develop fluency, expression, and reading confidence. Headsets that include built-in microphones and are designed to reproduce the student voice accurately and without distortion are critical to student progress. From a practical standpoint, headphones and headsets for school use are in a class by themselves. They need to be designed for constant, rugged use and be priced affordably for whole class, small group, and individual users. Warranties that work in the education setting are critical as well, to protect schools’ investment in this kind of equipment. A Headphone is a Headphone…Isn’t It? Headphones have become a standard consumer product but savvy school technology leaders and teachers have come to realize that many “consumer” models simply are not designed or engineered for the rigors of constant educational uses. Further, consumer warranties typically don’t cover school uses. It’s an important distinction and one that can save schools time and money over the longer term. 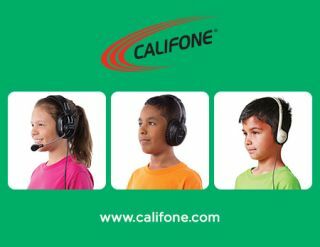 In 2016, Califone is celebrating its 70th anniversary and the company has been designing and delivering audio equipment for education throughout its long history. Case studies that provide educators’ own stories in using Califone headphones and headsets can be found at www.califone.com/casestudies and the company’s catalog, videos, and other educator resources are available online at www.califone.com/community.php. The company has recently introduced a new gaming headset, for use in instructional games and other game-based learning environments. Information about this latest Califone innovation is available at www.califone.com/products/gh507.php.